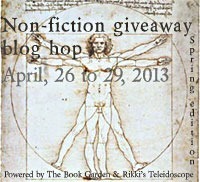 Most giveaway blog hops focus on fiction which is a real shame with all those fabulous non-fiction books out there. What better way to celebrate the wide world of all that isn't fiction than by a giveaway that shares the non-fiction love! I've read and reviewed a number of amazing non-fiction books last year and I decided to let you choose from an eclectic variety which I personally enjoyed a lot. Two winners will be picked through random.org on April 30th and will then be contacted by e-mail as well as announced here on my blog. The winners will have 48 hours to respond and if they fail to do so I will draw new winners. Great choices! I have Rabid on my wishlist (I think I heard about it from you) so fingers crossed! Thank you for the great giveaway! I am hoping for "If Walls Could Talk". Good Luck to everyone. Look forward to finding out who wins!